- Provide professional and profitable technical services for your clients. - Protect and recover unlimited servers within large and medium-sized enterprises. - Backup system, entire disk, one or more partitions, and selected files & folders. - Make backup easy with schedule, incremental, and differential operations. - Automatically clean up old image files based on specified value to save disk space. 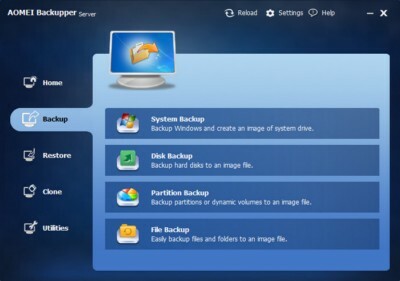 - Store backup images to local disk, external hard drive, CD/DVD, flash drive, or NAS/network, etc. - Email notifications; view backup logs; export/import tasks; compress, split, mount backup images. - Restore system, disk, partition, files, and folders to an earlier state when working properly. - Automatic partition alignment restoration to maximize performance, especially for SSD. - Recover individual files what you need without restoring the entire image to save time. - Windows PE & Linux bootable recovery environments in the event of system and disk crash. - Clone a hard drive to a new one without reinstalling Windows and applications. - Clone a partition to migrate system or data drive to another HDD or new SSD. - SSD, MBR Disk, GPT Disk, Dynamic Disk, UEFI/EFI Boot Mode. - Windows 8.1, Windows 8, Windows 7, Vista, and XP (all editions, including 32 and 64bit). - Windows Server 2012/2012 R2, 2008/2008 R2, 2003/2003 R2 (all editions, including 32 and 64bit). - Windows Small Business Server 2003, 2008, 2011, Windows Home Server 2011.